What? 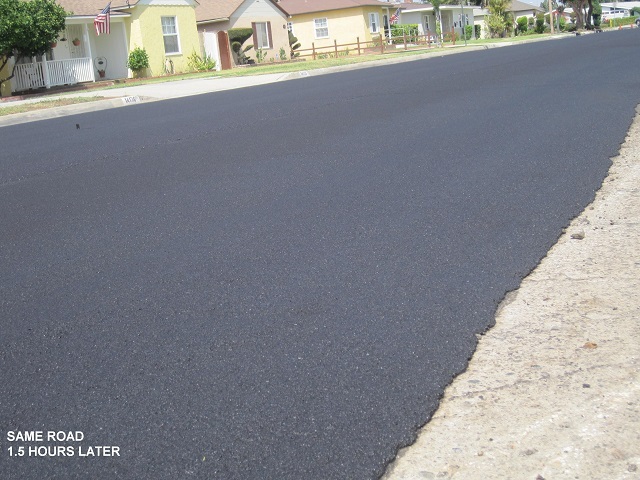 A slurry seal is the application of a mixture of water, asphalt emulsion, aggregate (very small crushed rock), and additives to an existing asphalt pavement surface. A slurry seal is similar to a fog seal except the slurry seal has aggregates as part of the mixture. This combined mixture of the emulsion and aggregates represents “slurry.” Polymer is commonly added to the asphalt emulsion to provide better mixture properties. The placement of this mixture on existing pavement is the “seal” as it is intended to seal the pavement surface. Slurry seals are generally used on residential streets. Why? Slurry seal is applied in order to help preserve and protect the underlying pavement structure and provide a new driving surface. Roads chosen for slurry seal applications generally have low to moderate distress and narrow crack width. Slurry seal applications serve to seal the cracks, restore lost flexibility to the pavement surface, provide a deep, rich black pavement surface color, and help preserve the underlying pavement structure. When? Slurry seal is typically applied on either an intermittent or cyclical basis. Location, weather, traffic loading, and pavement conditions are factors used to determine if a slurry seal application is appropriate. Roadways selected for slurry seal treatment are commonly those which have slight to moderate distress, no rutting, and generally narrow crack widths, and where a slurry seal treatment would help extend the pavement life until resurfacing becomes necessary. Roadways chosen for cyclical slurry seal applications would typically be treated every five to seven years. How? The asphalt emulsion and the aggregates are mixed in, and applied using, a purposely built truck, generally referred to as a “slurry truck.” Yes, I know, that’s rather obvious, but I didn’t make it up! Slurry trucks contain various compartments which hold the aggregate (fine crushed rock), water, polymer modified emulsion, and other additives, which are mixed in the on-board mixer. The slurry mixture flows out of the rear of the truck and onto the pavement within the confines of a box attached to the rear of the truck. The box serves to distribute the slurry mixture over the pavement. 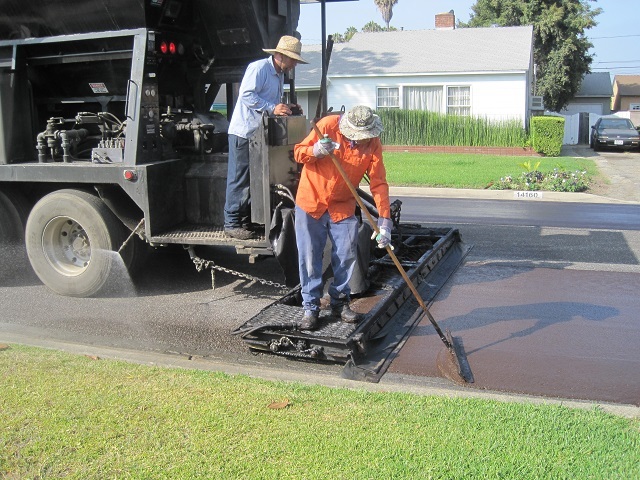 Workers with squeegees follow behind and assist in spreading the mixture, correcting areas not properly covered, and keeping the mixture off of concrete improvements such as gutters. A piece of burlap is often dragged behind the slurry truck with the goal of producing a smooth texture while spreading the slurry seal. 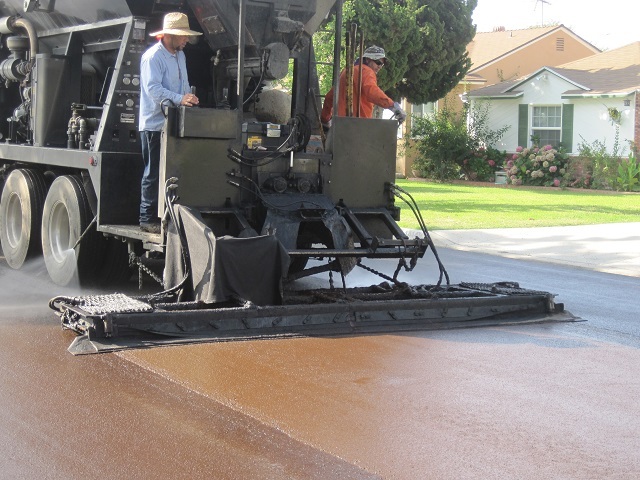 The texture of a slurry seal is different than that of asphalt pavement. The texture may have faint lines and be somewhat coarse. In addition, when the slurry is first placed the surface is tender and can be marked up by sudden turning movements. These impressions on the pavement are temporary as seasonal weather and traffic smooth out these imperfections over time. Once placed slurry seals need 4 to 6 hours to set or harden before the road is open for traffic.